New Yorkers take their pizza seriously. Perhaps that's because of New York's Italian roots, considering 30% of Italy immigrated to New York at the turn of the 20th century. The majority of these immigrants emigrated from the south, from areas such as Naples and Sicily, carrying with them recipes, traditions, and skill to turn mere flour and water into one of the most delicious foods ever created. 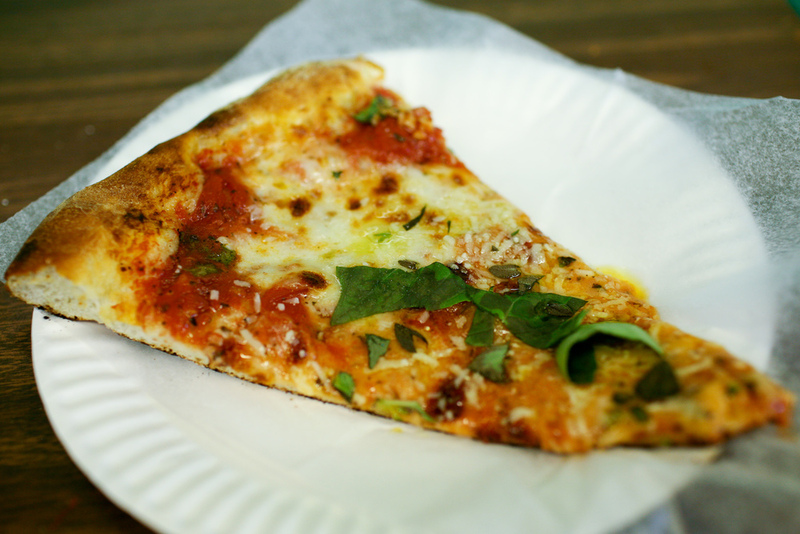 It is no coincidence, then, that New York has been labeled by many as the pizza capital of the world. But is it really? Truth be told, a visitor to America's pizza home may not feel the same way. While great pizza in this city can be found, the majority of pizzerias serve mass-produced pies lacking any sort of character or flavor. With the viral growth of chains like Sbarro, Famiglia, and "CPK," most of the city's great pizza has moved from an Italian artisan craft to the product of a big city assembly line. A relatively mundane mix of ingredients, in theory, pizza should be simple. But simple ingredients lend to complex preparation intricacies that, if left to the wrong hands, can result in a pizza that tastes terrible. Let alone soulless. A lack of skill, care and quality ingredients can lead to soggy crust, excessively salty cheese, oily residue, and a frown. 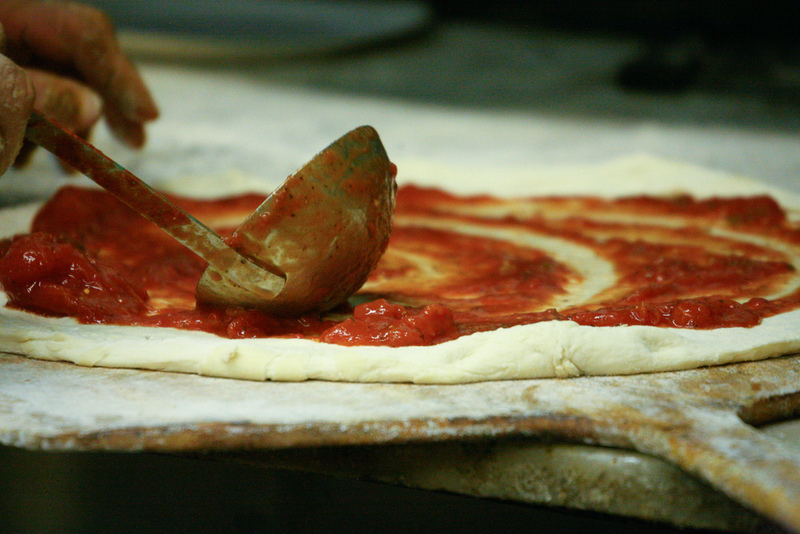 Great pizza is no easy task. There is one place, though, in a far-away land called Brooklyn, that is a Neapolitan oasis in a desert of dry, dense, tasteless slices. Some might consider it a little out of the way, as it's closest metro stop is Avenue J off the Q subway line, about 45 minutes from Times Square. 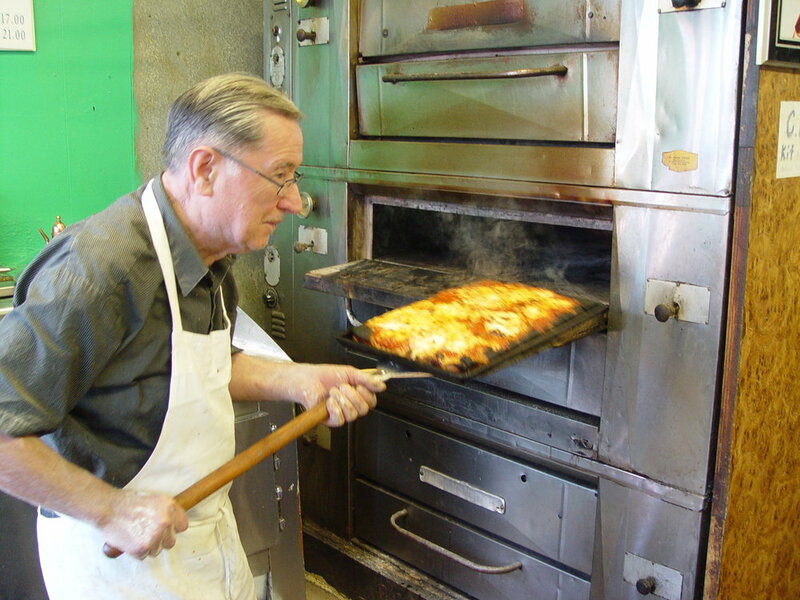 The pizzaiolo Domenico DeMarco has owned Di Fara for forty years. For forty years he's been the only one with his hands on the dough and those same hands, often bare, reaching into the hot pizza ovens. The place has been shut down on numerous occasions for health code violations. 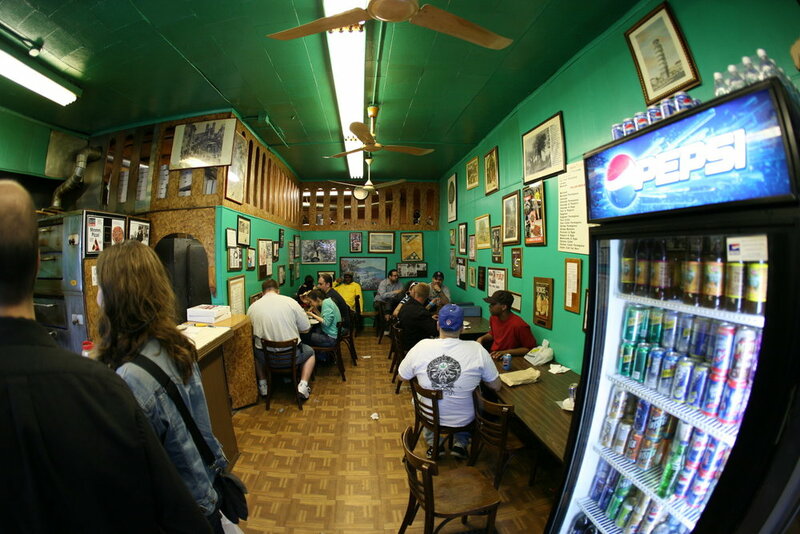 Zagat gives Di Fara the lowest rating in New York, an abysmal 4, for atmosphere and ambiance. Yet despite this, lines for pizza can wrap around the corner and into the night. If looking for "toppings" like pineapple and ham, or low-fat tofu with sustainable organic oregano and French comté, Di Fara is not the place. 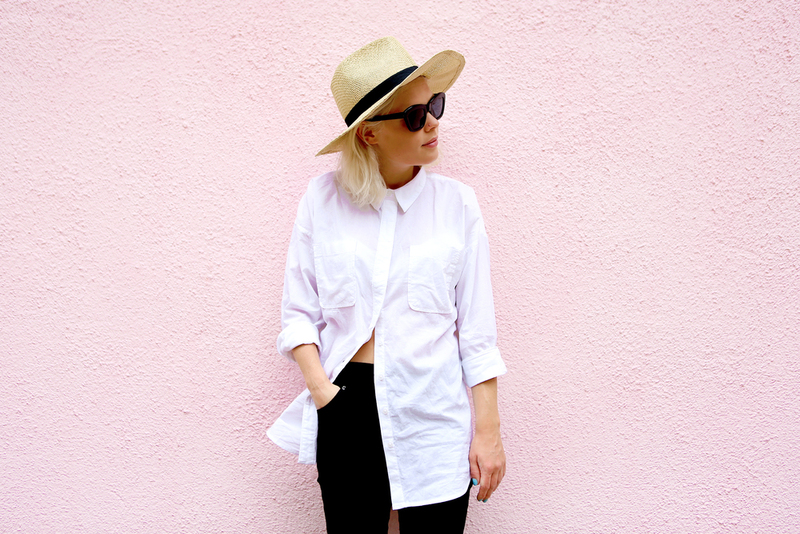 Here, there are no gimmicks. Mr. DeMarco is not bothered by the number of hungry people waiting in line for lunch. He stops to talk to locals, takes walks into the store room leaving the front counter unattended, and takes his time cutting fresh basil and pouring olive oil on every pie as he removes it from the oven. He absolutely loves what he does, and it shows. 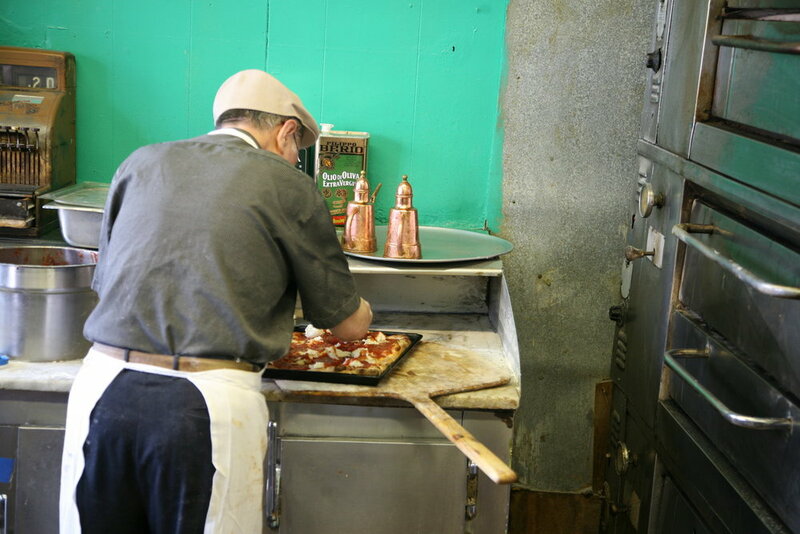 Di Fara's signature pizza is the square pie, often known around NYC as the "Sicilian" or the "grandma slice". This pizza is heavy; not only from the crust, but from the cheese and sauce layered on top. 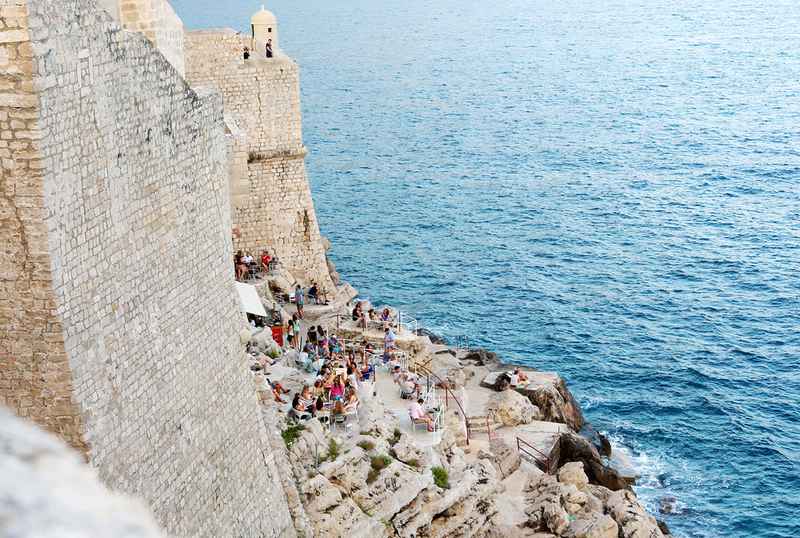 It's also New York-sized, meaning Italian onlookers might question why it's double the size of what they're used to. The crust is fairly spongy like a crisp, airy focaccia of about 3/4 of an inch thick. Thanks to the deep, heavy pan in which it is baked, the underside is always on the fine border of crispy brown and burnt black, with just a hint of charred flavor adding complexity to the flavor. Holding below the crust makes the excess flour sand off in a fine powder, conveniently absorbing excess oil that may have spilled overboard. His sauce tastes slightly of pork fat and ground bits of pancetta, a blend that contributes to a meaty tomato sauce with surprisingly little hint of smokiness. Molten islands pools of fresh mozzarella bubble on the smoking red sauce when the pie emerges from the oven. A bit of basil gets snipped on top, and the challenge begins -- do you have the patience to wait to dig in, or will that first delicious mouthful be consolation for a newly-scorched tongue? Health conscious onlookers might notice in horror that his pizzas are dribbled with olive oil not one, nor two, but three times. Once before the dough is set in. This causes the dough to act as a sponge in the oven, absorbing flavor while not sticking to the pan. The second time is just before placing the pizza in the oven. And the third time is just before service. This is not forgetfulness, but a relic from many years ago when pizza was created for flavor and not for California. Between the cheese and olive oil, this pizza packs just as much flavor as calories. And my, is it worth it. The second pie is what you and I might know as the traditional pizza margarita, but here it's known simply by it's shape: the "round". Otherwise known as the pizza barometer from which other pizzas can be compared, this pie has a much thinner crust and no pork in its sauce, but is just as delicious as it's sibling, the square. The crust remains crispy and never gets soggy. 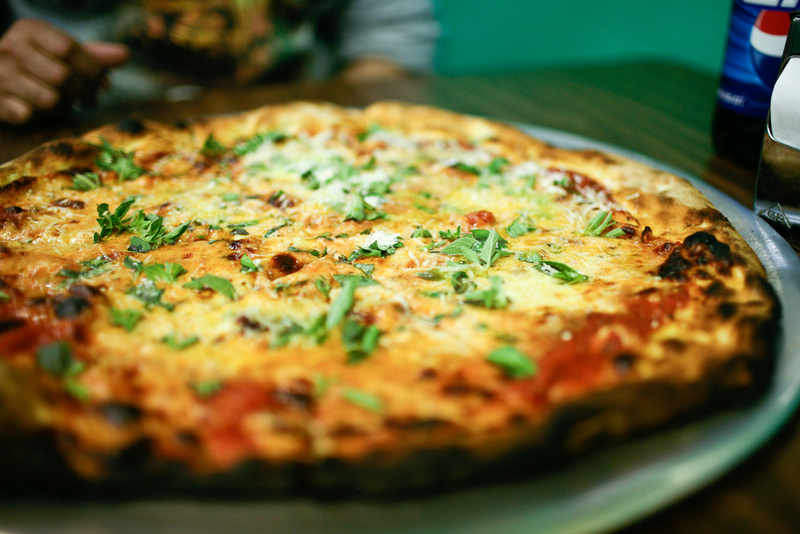 It's a lighter pizza by Di Fara standards, meaning a slice can be picked up with one hand without risk of collapse. The quality of the cheeses used becomes immediately apparent, because there is no orange oil leaked from baking any of them, as seen with cheese of low quality. The only visible oil on this pie is that of the Colavita and Philippo Berio oil chef DeMarco uses. For this pie, DeMarco uses three types of mozzarella of different moisture contents. 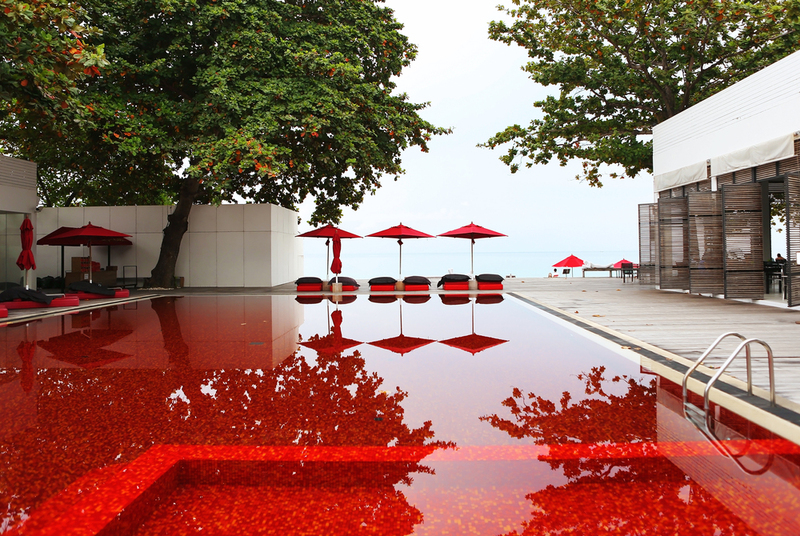 The first is called "La Bonita," and comes from Caserta, Italy, near where the chef is from. The second is Fior di Latte, a bufala mozzarella submerged in water tubs. The last is regular mozzarella from the Grand Cheese Company. This mix of three cheeses of different salt contents adds to the complexity of the slice, mixing different varieties of salt and sweet. What continues to amaze me is the way Chef DeMarco is able to crisp the crust -- even blackening certain parts -- without burning. Despite his jovial conversation with the line out the door, or his long, delayed trips into the back to bring forward more cheese or flour, those pizzas are always taken out of the ovens at precisely the right time. Sometimes he even uses his bare hands! Scattered about on top of the sauce and cheese is freshly cut basil that Chef DeMarco cuts with plastic scissors seconds before serving. But even though Di Fara offers New York's finest slices, there is a more impressive, lesser-known option on the menu. 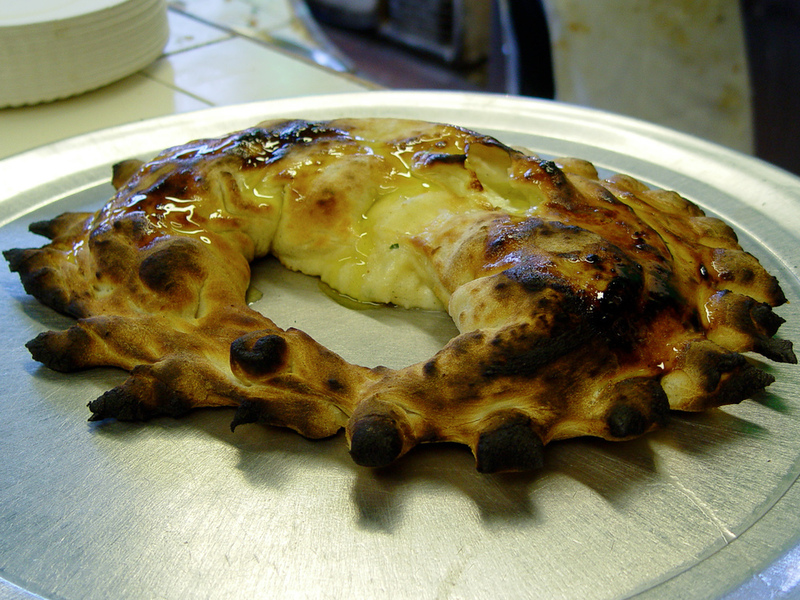 My most memorable experience at Di Fara involves not the pizza for which it is so (rightfully) well-known, but for a crescent shaped stuffed pillow of cheesy goodness, thoughts of which make me contemplate the quickest return possible. Di Fara's calzone is what I believe to be the best item served there. It starts with pizza dough folded in half around an overflowing heap of fresh ricotta cheese. Overflowing in the sense that no matter how tightly he seems to seal this giant Italian dumpling, fresh ricotta always seems to find its way out. After folded he compacts the edges so as to form a tentative seal, locking in the moisture and flavor of the fresh cheese. Delicious. Now comes the magic: he takes scissors and clips small half-inch dimples in the sealed region around the crust, which result into this perfect texture when combined with the moisture from the ricotta. This saw-tooth patterns creates a texture very similar to that small sweet spot of a pizza in-between the crispy crust and moist slice, and it's everywhere. 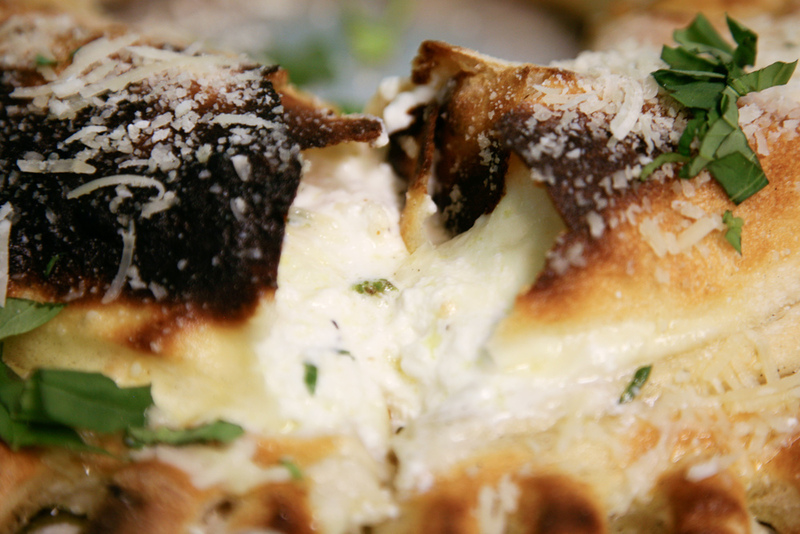 Lightly seasoned with fresh basil and olive oil, the dominant flavor here is fresh ricotta and perfectly baked dough. It is absolutely delicious, and well worth the hour wait, as each calzone is baked to order. While waiting in line amongst Brooklyn locals and tourists trekking an outer-borough culinary adventure, diners' certainly get hungry and may even briefly question the merits of waiting two hours for pizza. The crowd waiting on line can at times be pushy and direct; after all, this is New York. But the scent of fresh pizza can be pretty convincing, and somehow makes waiting not so bad. Di Fara is edible proof that fine dining needs no minimum budget or Michelin stars, since the cost of a pie or Calzone is a steal for $15. This is the freshest and best tasting pizza outside of Napoli, and anyone in New York for more than a few days would be insane missing out on something truly special if they didn't make make a lunch-time trip to Brooklyn and say hello to Domenico DeMarco.